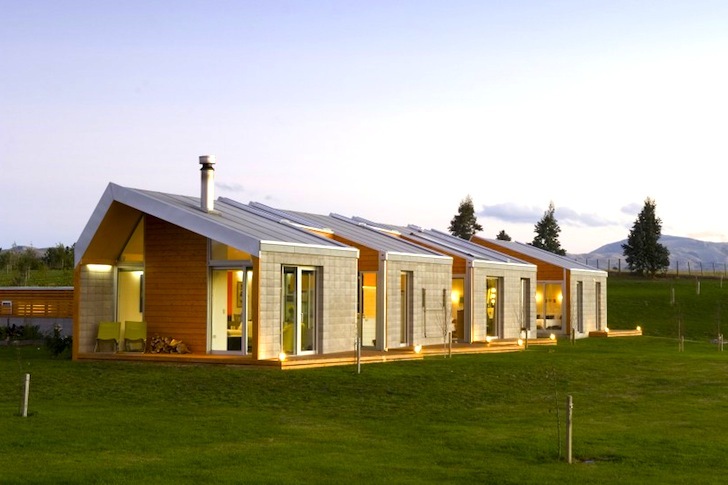 Bonnifait + Giesen is making quite a name for themselves lately with a slew of sustainable homes in New Zealand. 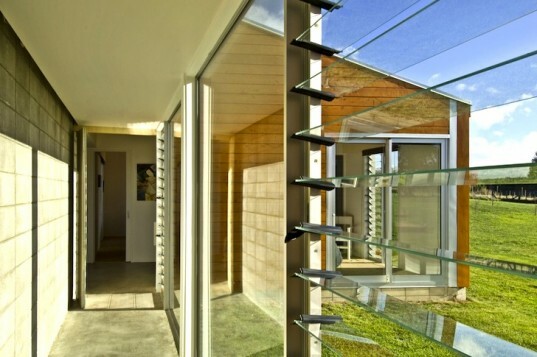 The pretty Cornege-Preston House located on a sprawling 10,000 sqm site in Wairarapa is among their latest, and it features exemplary passive solar design, a massive rainwater capture system, solar-heated water and an attractive but responsible palette of building materials. The Cornege-Preston house is 40 meters long and six meters wide. Spread out thusly, which is made possible by a large plot, every section of the home is exposed to achieve maximum solar gain. Oriented to face the northwest, a concrete link between the guest wing and main home acts as a solar sink that radiates heat throughout the entire dwelling. And virtually none of these thermal gains are lost thanks to superior wool insulation and double glazing. Sometimes too much heat is not a good thing, which is why sliding doors and louvers were necessary to promote natural ventilation, while skylights let the light in. Underfloor heating increases efficient energy use and a rooftop solar panel heats most of the home’s water with the power of the sun. 400 trees were planted on the site and there are two 25,000 liter tanks that capture rainwater. The designers also used sustainably sourced Macracapa pine and Italian poplar for cladding, decking and ceiling linings, topping off what their low-tech approach to green design. Underfloor heating controlled by the electricity thermostat keeps the home nice and toasty!